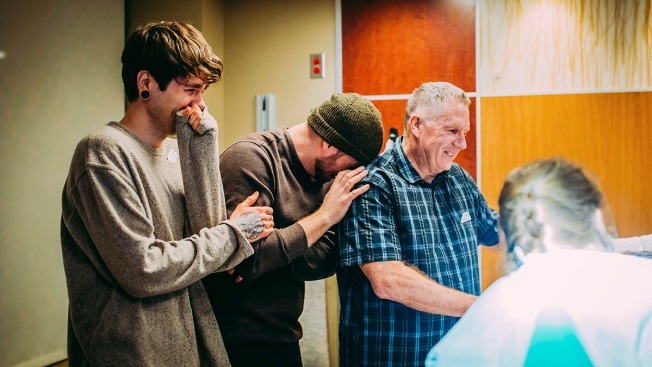 In this March 25, 2019 photo, Elliot Dougherty, left, and his husband Matthew Eledge, second left, react during the delivery of their daughter at the Nebraska Medical Center in Omaha, Neb. Matthew Eledge's mother, Cecile Eledge, volunteered to be the surrogate mother to her grandchild, conceived with sperm from Matthew Eledge and an egg from Dougherty's sister. A 61-year-old woman serving as the gestational surrogate for her son and his husband gave birth to her own granddaughter last week, NBC News reported. The woman, Cecile Eledge, delivered the nearly 6-pound baby, Uma Louise Dougherty-Eledge, at the Nebraska Medical Center in Omaha at 6:06 a.m. last Monday. After her son, Matthew Eledge, and his husband, Elliot Dougherty, decided to expand their family, Dougherty’s sister, Lea Yribe, offered to donate her eggs. The couple planned to find another surrogate to deliver the child, but they found the process confusing and weren’t completely confident about navigating in vitro fertilization. At first, her son was skeptical. Was a 61-year-old woman in a position to deliver a baby? “I told her, ‘Mom, you’re postmenopausal. … You can’t do that, right?’” Matthew Eledge recalled. But according to doctors, she could.